The Eiffel Tower was constructed for the Universal Exposition of 1889, the centennial of the French Revolution. Little did the architect, Gustave Eiffel (1832-1923), know that it would become an icon of the Parisian landscape. There are many ways to get to the Eiffel Tower. The one that offers a most stunning view of the Tower is from the Palais de Chaillot. Take the Metro, lines #6 or #9, to the Trocadéro station. Once at the Trocadero station, follow the exit signs to the Palais de Chaillot/Eiffel Tower. If you happen to take another exit to the street, just look for the most impressive building around. That will be the Palace of Chaillot. The others are restaurants. The Palais de Chaillot is made of two columned, curved buildings connected by a large plaza. It was built for the World Exhibition of 1937. The Palais houses the Théâtre National de Chaillot and the Cite de l'Architecture et du Patrimoine in the East Wing, and the Musée de l'Homme(Museum of Mankind), the Musée de la Marine (Maritime Museum) in the West Wing. Walk through the plaza, past the many gilded statues and the colonnaded wings of the Palais, and you'll get an extraordinary panorama of the Trocadéro Gardens, the Seine river and the Eiffel Tower. Stairs lead down to the left and to the right to the Jardins du Trocadéro, a wonderful garden of expansive lawns, flowering shrubs, large trees and children's playgrounds. Stroll along-side the Varsovie Fountains. If your timing is right, you could be treated to a water display from the many water cannons in the fountains (they're not always working). The pools are decorated with statues and bas-relief carvings. Walking down either side of the fountains towards the river will bring you to Avenue de New York. Once across Avenue de New York, you will be on the bridge, Pont d'Iéna. Half-way cross the bridge, look to your left. In the distance you will see the Basilica of Sacre Coeur. On the Tower side of this bridge are the concessions and landing areas for boat tours along the Seine river. On the right side of the bridge is the Batobus, the water-taxi of the river which makes stops at the major sites. On the left side of the bridge is the Bateaux Parisian which offers hourly river tours, including lunch and dinner cruises. Once across the Pont d'Iéna, you will find yourself under the pillars, the legs, of the Eiffel Tower. Look up into the center of the structure. You may, at this point, decide to take the elevator up the Tower. You have the choice of buying a ticket for going to the first floor, the second floor or all the way to the top. There is also the option of taking the stairs to the second level. The top is no longer available by stairs. The Eiffel Tower is open everyday from 9:30 a.m.-11 p.m. Last admission is at 10:30 p.m. Hours are subject to change depending on the crowds of people, the weather and the event of strikes. Ticket prices are for adults, 1st floor 4.20 euros, 2nd floor 7.70 euros, top floor 11 euros. For ages under 12 years, 1st floor 2.30 euros, 2nd floor 4.20 euros, top floor 6.00 euros. Children under 3 years old are admitted free. For climbing the stairs the price for adults is 3.80 euros, for ages under 25 years the price is 3 euros. Children under 3 years are admitted free. Only the 1st and 2nd floors are available by stairs. The top floor is no longer available by stairs. The Eiffel Tower is situated in the Parc du Champ de Mars. From the Seine river, the Champ de Mars stretches a few hundred meters to avenue de la Motte Piquet, and the grounds of the military academy, Ecole Militaire. 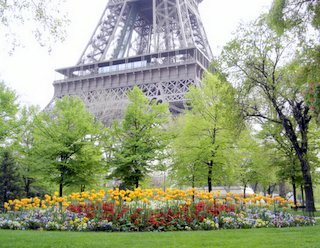 The Parc du Champ de Mars is criss-crossed with many wide walking paths that wind past plantings of flowering shrubs and beds of flowers. The expansive lawns and large tress make it a great place for a picnic. 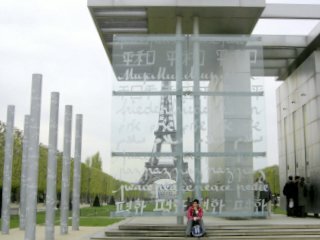 Continuing your walk away from the Eiffel Tower, you will come to the Monument to Peace. There are 32 columns here with the word "peace" written in 32 languages. Inspired by the Wailing Wall in Jerusalem, where people slip notes of prayers into the cracks of the Wall, here, computers are available for leaving your message of peace. Past this monument is the Place Joffre and then the Ecole Militaire, which had as one of its students Napoleon Bonaparte. By turning left (east) here on avenue de la Motte Piquet, you will soon come to avenue de la Bourdannais and the Place de l'Ecole Militaire where the Metro station Ecole Militaire on line #8 is located. You can either take the Metro to your next destination or continue down the left side of avenue de la Motte Picquet a short distance to rue Cler, one of the picturesque market streets of Paris.